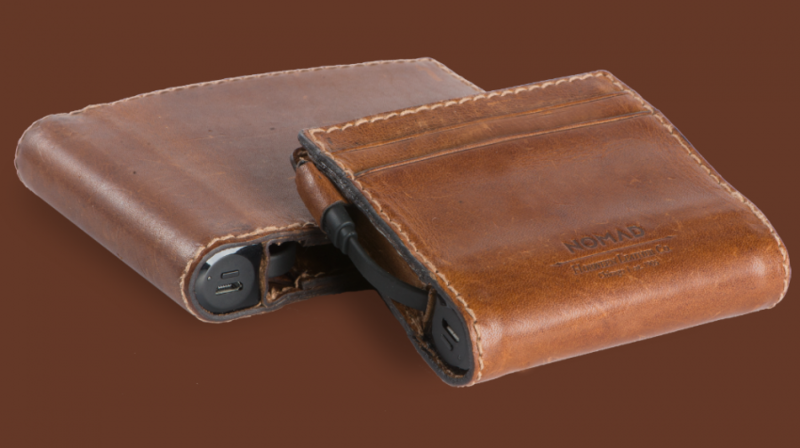 What would you say if you knew there was a stylish leather wallet with a built-in charging system for your smartphone? Well, the Nomad Leather Charging Wallet looks like a normal wallet except it comes integrated with a battery and charging cable for charging up your phone or tablet wherever you go. The idea is that while it can sometimes be tough to find a place to recharge your phone while o the go, you would seldom leave home without your wallet. That’s where the Nomad Charging Wallet comes in. The wallet doesn’t only hold your cash and cards. It also includes a battery hidden within its spine with enough juice to bring an iPhone 6s up to full charge. Obviously you can use external battery packs or battery cases to charge your phone on the go, but the thing about these charging solutions is that they tend to be bulky. Also, charging your phone from your car or looking for the nearest receptacle may not always be an option. And given that some small business owners and entrepreneurs need to travel a lot and constantly have to stay in touch for business, the charger fills a need. Now it’s easy to bring a portable charger that you can never leave behind to help you get through the day. It’s also easy to take on business trips so you never find yourself left in the cold with a dead phone and no power source in sight. Nomad Goods, Inc., is the company behind the Nomad Charging Wallet, and a number of other innovative tech accessories for smarphones and smartwatches. The company prides itself in making useful items that double as device chargers. The items fit seamlessly into a user’s lifestyle, freeing you from the need to always have a traditional charger on hand. Company co-founder, Noah Dentzel, started thinking of these solutions when traveling around Spain. He was tired of trying to keep a phone charger handy. So he thought: why not nest device chargers into everyday items? Partnering with Brian Hahn, the two co-founders conceptualized the Nomad chargers, starting with the NomadKey. The NomadKey is a small USB jack that clips easily onto a keychain, ensuring you never have to worry about forgetting your charger. Unless you forget your keys,Q of course. Noah and Brian kept the momentum going with new products, including the Nomad ChargeCard, Nomad ChargeClip, Nomad Plus and Nomad ChargeWallet. The company claims the Nomad Wallet is crafted from high quality Horween leather. It features a 2,400mAh lithium-ion backup battery that takes roughly 2 hours to fully charge. According to the company, the battery utilizes an advanced SoC (system on chip) microprocessor that allows it to fit into the folds of the Wallet. Hidden inside the Wallet is also an Apple MFi Lightning or Type C cable that you can pull out and use to charge your iPhone or other device. Simply connect your phone through the Lightning cable to charge. You would expect the Wallet to be big and bulky considering that it comes with the battery and Lightning cable tucked away inside. The company claims the product is just about the same size as a normal wallet. It measures 9.5cm (height) x 12.5cm (width) x 2.5cm (max thickness), says Nomad. There are two styles of Wallet: a classic bi-fold option for more cash and card carrying capacity, and a slim version for light and minimalist carry. The Bi-fold can carry six cards, along with bills in the wallet’s main compartment, while the slim fold can carry four cards along with bills in the main compartment. If you’d like to buy the Nomad Leather Charging Wallet, it is available for pre-order on the company website priced at $119.95. Shipping of the wallets is expected to begin July 30 (for the Lightning) and August 31 (for the USB C), with free shipping in the U.S. and $10 shipping charge worldwide.